Wall Art from Local Reclaimed Wood. 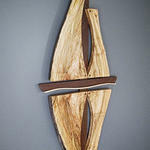 All my art pieces have local reclaimed wood from the Cowichan Valley. I also use live edges, burls, figured and spalted maple wood. Duncan, v9l 0b1, 6026 Stoneridge Rd. Contemporary Custom Furniture We design and build custom furniture, lighting and many other unique items from our live/work property, located just five minutes northwest of Duncan.